Thanks, Dear Straight People, for publishing this article. 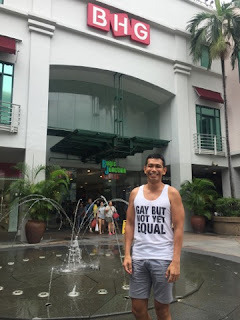 In this opinion piece, I hope to begin a national conversation by giving the responses of different Singaporeans to my tank top. I met them in various public spaces, mostly cafés and restaurants, in the course of the week after my Facebook post about the complaint went viral. They are not a representative sample of Singaporeans, but they can be trusted to give their honest response. In fact, when I asked them for their views, I told them that mixed feelings were welcomed. I think, in the current debate about gay equality, it is important to listen closely and understand one another before we reply. Read the reactions. Get the Viral Tank Top! 4 tank tops to go to the 4 highest bidders! The tank top that got me into trouble with Singapore's SAFRA gym. Designed by Mark Yeo. Gently worn, freshly washed, lovingly ironed. Get a memento of the gay tank top affair. Wear it about proudly. It's a talking piece. Support gay equality. All proceeds benefit Singapore Unbound, a NY-based literary non-profit that champions freedom of expression and equal rights for all. Opening bid: USD50. Let the bidding begin. Please help to spread the word. Thanks! 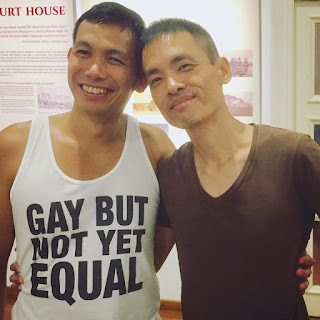 I'd gone back and forth about whether I should wear my gay tank top at tonight's Singapore Unbound Fellowship Award Event. Singapore Unbound is the NY-based literary non-profit I founded to build cultural exchange between Singapore and the USA. It is not solely about gay rights. Would I be misrepresenting the organization by wearing something with so personal a statement, and so informal as a tank top? Would I be identifying the organization too closely with me? I've inspired a cartoon! Lol. Wish I look like that. Thanks, toastwire! My brief piece of reflection on SAFRA's statement. Thanks, Sean Foo, for soliciting and publishing it on Dear Straight People. SAFRA came out for fairness. They did not give in to homophobia. Thank you, SAFRA! Your statement proves that Singapore is ready for diversity. "In a statement sent to Channel NewsAsia, SAFRA said Mr Koh's attire did not contravene any of the gym's rules and regulations. "We have also spoken to the gym users who gave the feedback. From our conversation with Mr Koh, we believe there was no intent to cause discomfort to other gym goers so we hope this can be resolved amicably," said SAFRA." A few users of the SAFRA Mount Faber Club Gym complained about my tank top to the gym manager. They accused me of trying to change a sensitive social policy or issue. My tank top says, “Gay But Not Yet Equal” on the front, and “Equality For All” on the back. I learned of their complaint when I arrived at the gym this morning. I have been using this same gym when I visit Singapore every summer. On this trip back to Singapore, I had gone to the gym three times; today was my fourth visit only. The gym manager had tried to call me about the complaint but could not reach me. He spoke to me on the phone in the gym. Saturday, conducted a Sing Lit Station workshop on revision with three participants. Andrea, an intern, made a valuable addition. Then attended the Migrant Poetry Evening at The Arts House in the tank top designed by Mark Yeo. Strange limbo while waiting to fly to Singapore tonight. I've packed, now waiting for my order of tee-shirts, and then the airport shuttle. Last Thursday, celebrated KM's birthday by treating him to dinner at Chomp Chomp. He has taken early retirement because of Parkinson's, and will be released from work next month. On Saturday, we had the Calatayuds over for dinner. Conversation flowed back and forth. Everyone seemed to have had a great time. Sunday, we spent on Christopher Street pier and got sunburnt. Undeterred, we went to Rockaway Beach on 4th of July. Very crowded, but good fun. We now have an almost straight train there, the A.